lived in a glorious landscape of hills and valleys, bright with seasonal tree blossoms, orange and yellow poppies, or golden broom. Their gardens produced a profusion of staples: grains, grapes and olives that converted to porridges, wine, and olive oil. Meats and cheeses came from an abundance of livestock and wild animals. Metals in the mountains made them rich. From about 1000 B.C.E. to the beginning of the Roman Empire, they settled in this region, perhaps coming from Asia Minor (today: Turkey), or from the north over the Alps, or perhaps were native to the land that is now Tuscany and Umbria, Italy and became Italy's first great civilization. the Etruscans sprung full-blown into a grand, powerful and wealthy society, with values similar to those of modern America--but in the eighth to fifth centuries B.C.E. women and men who banqueted and danced together when Romans, Greeks and Egyptians separated the sexes. Thought of as wild, they celebrated life with sumptuous festivities and luxuries, dining on choice delicacies, drinking finest heavy sweet wines, while the barbarians ate roots and dormice. Elegant leather shoes adorned their feet when their barbarian neighbors went barefoot. they devised the so-called "Roman arch" and raised perfectly fitted, stone walls without mortar, planned water drainage systems that still function, built roads and tunnels that are some of the blueprints for modern transportation, and constructed everlasting cities (necropolises) for their dead. 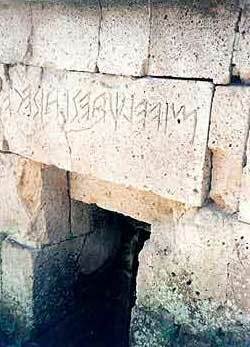 The Etruscans passed their alphabet to the Romans, and our modern alphabet is thus derived. they held sway over the Mediterranean region, stealing men and women to be slaves, trading iron, bronze crafts, household goods and weaponry, for gold, Egyptian alabaster statuary, jewels and even ostrich eggs for their tombs. they formulated a method for creating blackware (bucchero) pottery and granulated gold jewelry, that stumped later craftsmen until the twentieth century A.D.
their art depicts enthusiasm for life, when drudgery was commonplace in a barbarian world. their influence inspired artists such as Leonardo da Vinci, Donatello and Botticelli during Renaissance Italy. the Etruscans spoke a non Indo-European language not fully deciphered today. Always suspect of their paradoxical, cultural origins: mythological tales of the Etruscan founders and legendary rulers were questioned by well known historians in their own time-the Greek, Herodotus, and the Roman, Livy. 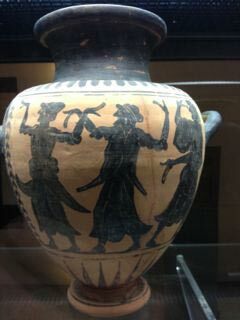 With an Etruscan twist, their complicated sky, sea and underworld gods and goddesses were based on Greek imports. The Etruscan philosophy was strange at the dawn of western civilization: based on the reading of animal entrails, the flight of birds, and a code of ritualized laws coveted by the Romans. wiped out by wars, and assimilated into Rome's strength, by the first century B.C.E. Ever since, what traces remain of Etruscan culture have been dug up by tomb robbers and archeologists. Read more about the Etruscan people in Rosalind Burgundy's historic novels.